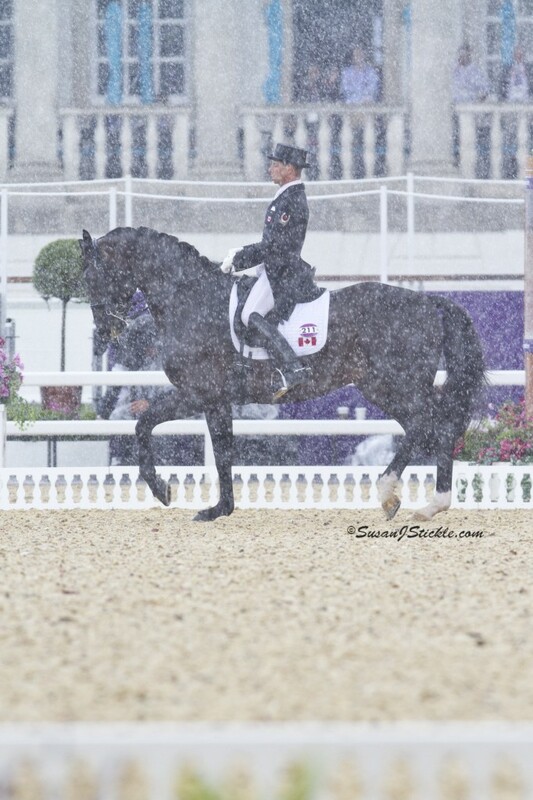 David and Chrevi’s Capital compete during a downpour at the 2012 London Olympic Games. For those who aren’t aware, I was eliminated in my Olympic debut in London this past year. Chrevi’s Capital and I were performing our grand prix test in the Olympic stadium during a horrific downpour. Unfortunately, Capital spooked and I was eliminated when we were not able to continue our test within in the 20-second time allowed. As there are only three riders per team and all three scores counted for a team result, my individual elimination meant that the Canadian Team was automatically eliminated as well. To give you an understanding of what happened, I’ll start by saying that it was a “perfect storm” of many things, starting with the weather. When I watched the video play back, I realized how extreme the weather was that we had to ride in. Rain, wind, hail. It was weather that I would not hand walk my horse in, or even allow him to go out in a paddock, let alone ask him to perform at his best at the Olympic Games! I also can’t stress enough how noisy it was in that 23,000-spectator stadium. The stadium seating was so vertical; it had to be built almost straight up with temporary seating and all of the scaffolding that was necessary to build the structure and stairs created noise in the arena unlike anything I have ever heard. Add that to the fact that it had started pouring rain and people were trying to get in and out of the seating areas, putting up umbrellas, pulling out jackets and hats, trying to get some shelter from the heavy rain . . . it was just stimulus overload! 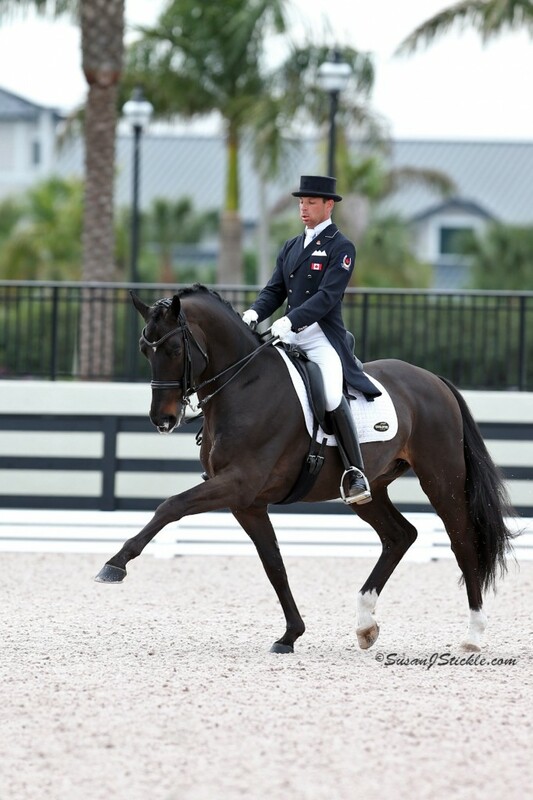 David and Chrevi’s Capital won both the Grand Prix and the Grand Prix Freestyle at the 2013 CDI-W Wellington Dressage in Wellington, Florida. Capital couldn’t concentrate and when he lost concentration, he went into ‘panic mode’ and was petrified beyond reason. By the time he came back to me, I had exceeded the 20-second time limit you are allowed for disobedience in the ring. He is such a trusting horse that I could have gotten him to concentrate on his job again, but not in the allotted time of 20 seconds. Facing the media in the mixed zone immediately afterwards wasn’t as difficult as you might think, mainly because I hadn’t processed all of the emotions yet. I wasn’t angry or upset with my horse. I was just shocked and disappointed. “Did this really just happen?” was what I was thinking to myself. I really felt like it was out of my control. I’m not sure if or what I could have done differently. I felt extreme disappointment for my owners, my sponsors, my team and my country more than I was feeling disappointment for myself. I felt that I had let everyone down, including all the people who had flown in to watch and cheer us on. My teammates were very supportive and helped me to accept that there was nothing I could have done to change things in that moment. It had happened and now it was time to figure out how to move forward. We spent that evening in London surrounded by family and friends and supporters and we all commiserated together about what an unfortunate turn of events it had been. While grieving is an important part of the process, it’s also important not to dwell. While it was difficult, I tried to be positive and concentrate on moving forward. The next day, I started to ask myself, “What’s next?” I spent time thinking about what would be the next step in this horse’s career. How would we go forward and what would our goals be? Being a very goal-oriented person, that was an important step for me. To do that, I needed to have a goal. So, I got on my horse and started training again for the future with my eyes set on the 2014 World Equestrian Games in Normandy, France. The next stage was very important for me. Upon my return home, after Capital had a short break, I began to concentrate on Dressage at Devon at the end of September. I felt that Devon would be an important step in Capital’s career. It is a big show in one of the largest stadiums we have in North America with a lot of atmosphere. I felt it would be important for him to have a positive experience there, having had such a fright at the Olympics. With Devon as my goal, we began to work backwards. Building his confidence was my focus. 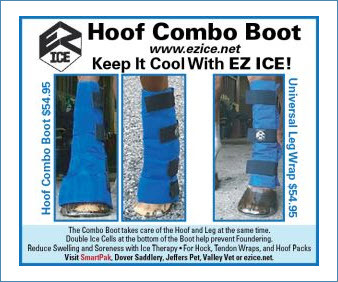 We went to the CDI-W NEDA Fall Festival in Saugerties, New York, which I felt would be good preparation for Devon. It was the first time I had competed Capital after the Olympics and I was nervous. I didn’t know what he would do in there. I wanted to give him a positive experience. I felt I owed him that after what happened in London and I didn’t know what his reaction would be. I think it’s normal to feel that way after what we had gone through. 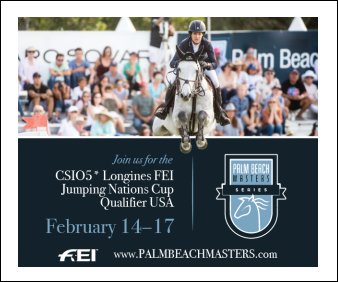 David and Chrevi’s Capital were the only Canadian combination to advance to the Freestyle at the 2013 World Dressage Masters Palm Beach. As I write this, we have now done six shows since the London Olympics. I believe in my horse and I believe that London really was an unfortunate one-time situation. Having said that, I do believe that Capital suffered from what we humans would refer to as Post-Traumatic Stress Disorder. As a result, we’ve carefully picked the shows that Capital goes to and when. I don’t want to avoid situations that might make him a little anxious. Instead, I want to take him into situations like that so that I can train him and build him up and let him know that he can handle those types of situations in the future. My Olympic experience took some thought and time to recover from and there was great disappointment involved. But I think anyone involved with horses at any level, be it an amateur, a junior, a recreational rider or a professional, and has to be able to go through ups and downs in their riding career. It’s all part of the journey. About the writer: David Marcus made his grand prix debut in January of 2012 and, six short months later, had earned a place on the Canadian Dressage Team for the 2012 London Olympic Games. 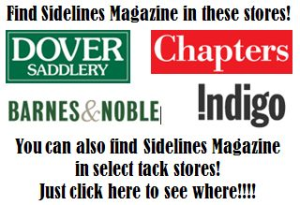 He operates David Marcus Dressage, a full-service training facility, just west of Toronto. 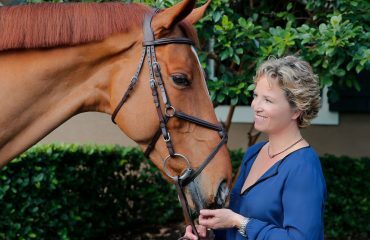 In the winter, he is based in Wellington, Florida. David, 32, currently campaigns Chrevi’s Capital and Don Kontes at the grand prix level for owner Deborah Kinzinger. 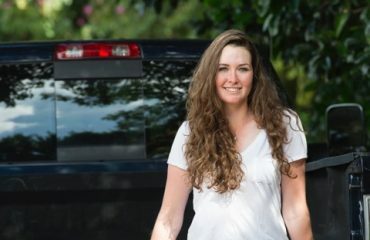 “My Story” is a first person account of life in the equestrian world. 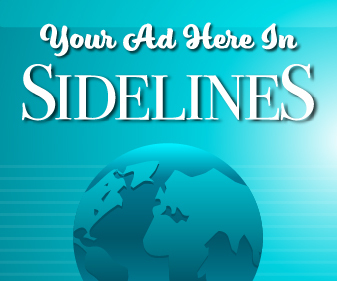 To have your story considered, send a brief description of your story to editor@sidelinesnews.com. Thank you so much for sharing your story, David. It was very interesting to read – I have often wondered what you and Chrevi went through. I truly felt for you and your horse on that day! By you sharing your story, you make me feel better about my own show ring mishaps and up and downs in riding. 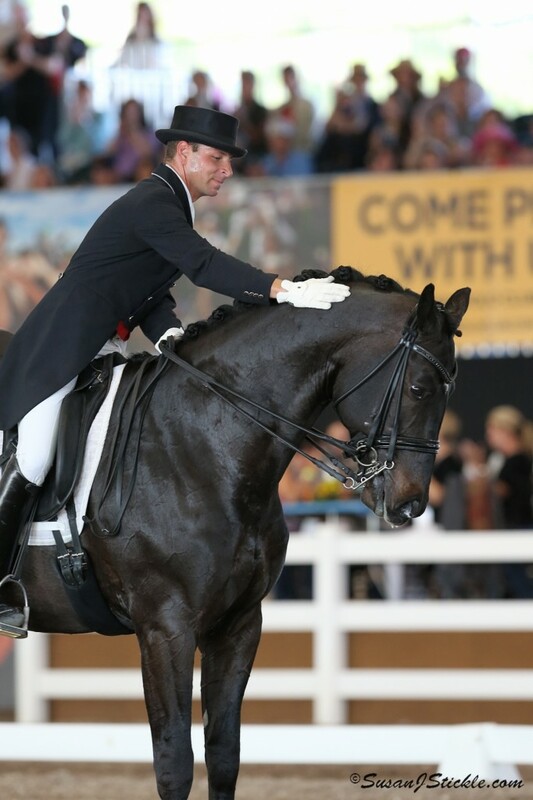 And, It is always nice to hear that the “big guys” in dressage are human too! All my best, Cindy. P.S. : What a great expression you have in the last photo that accompanies the story! There should be rules in place for extenuating circumstances beyond a rider’s control. This is a tragic story of rules before athletes. Many forums of athletics pause an activity and wait for the storm or other problem to pass. Why not dressage? Especially when you can’t explain to a horse why he’s performing in a horrible situation. 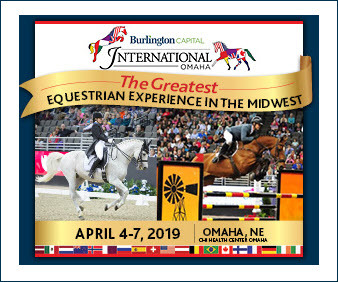 I hope this is examined carefully because we should be giving every equine athlete and their human partner the best possible chance to show their hard work. Do they not allow a “rain delay” as is done in so many other sports? It sounds like this storm also put you and your horse in a dangerous situation. I am sorry this happened to both of you but glad you have managed to move forward. I just want to say the whole time through that ‘perfect storm’ I was very proud of you and Chevri, and so proud to say you were on our team! You both handled the storm beautifully and, when Chevri could no longer handle what I believe most horses wouldn’t have even started their test in, you both exited the arena with grace and dignity. The poor guy tried his best, you really could see that, and you were trying your best too! What more could we ask? And on a side note: Who brings small screaming children to a dressage test?!?! Those spectators were horrible! Thank you for sharing your reflections. I will continue to see the footage of the Olympic ride as an exemplar of the most outstanding riding – your calmness and respect for your horse’s needs were extraordinary – and also of outstanding sportmanship. The unfortunate results regarding the competition in no way take away from your wonderful example in this regard. What a role model to the sport! David, thank you for sharing your perspective! What stuck with me after watching your test was how supportive you were of Capital, how still and soft you stayed and how, once eliminated, your only concern seemed to be for your horse. As others have said before me, that is inspiring horsemanship. I can’t even begin to imagine the pressures and expectations that come with riding for a team at the Olympics. That you could park these to care for your horse makes me so proud that you represent Canada! 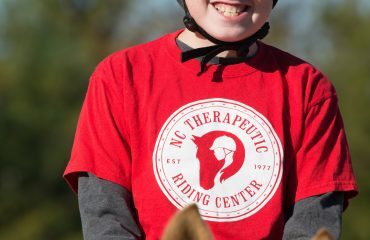 Thank you for sharing your story, it has given me such a good insight, you have made me feel extremely positive about my own horse that is very sensitive to her surroundings, and that it is us the rider to help them through difficult experiences, and build their confidence up block by block if it is broken down. David you are an amazing athlete and certainly one we should all take a page from, you are a wonderful human being and it makes me proud to watch you even though I am British, your a very special man with such a great understanding of you horse, reading your story in my books makes you a gold medalist. Looking forward to seeing you in the arena. Your horse is very brave, I don’t know a horse that would try to get through that kind of weather.